District 3 supervisor candidate Aaron Peskin provided consultation for Polk Street bike lane opponents earlier this year on filing a lawsuit over the street’s redesign. Despite his recently-declared support for full bike lanes along Polk, Peskin confirmed his one-time involvement with Save Polk Street, a group of merchants which has fiercely opposed protected bike lanes to preserve car parking. Peskin said that he had let Save Polk leaders know “what their rights and options are” when they’d considered filing a lawsuit against the city in anticipation of the plan’s approval in March, even after it was heavily watered down. Streetsblog asked Peskin to clear the record on the rumors last week at a campaign event hosted by the furniture store Flipp. Flipp’s owner, Dan Kowalski, has been the primary press spokesperson for Save Polk since the group formed over two years ago. Peskin said he’d only met Kowalski for the first time that evening. I always let everybody know what their rights and options are, the same way that I let tenants know that they can disappear into the middle of the night, but they also have options. If you’re asking whether I encouraged anybody to file a lawsuit, no, but people will say, Do I have rights of appeal? Yes, you’ve got rights of appeal. These are the things that you can do. I’m always clear with people what their rights are. It’s important that people know what their rights are. That’s part of the way you bring people together — you let them know, these are the powers you have, these are the powers these people have. 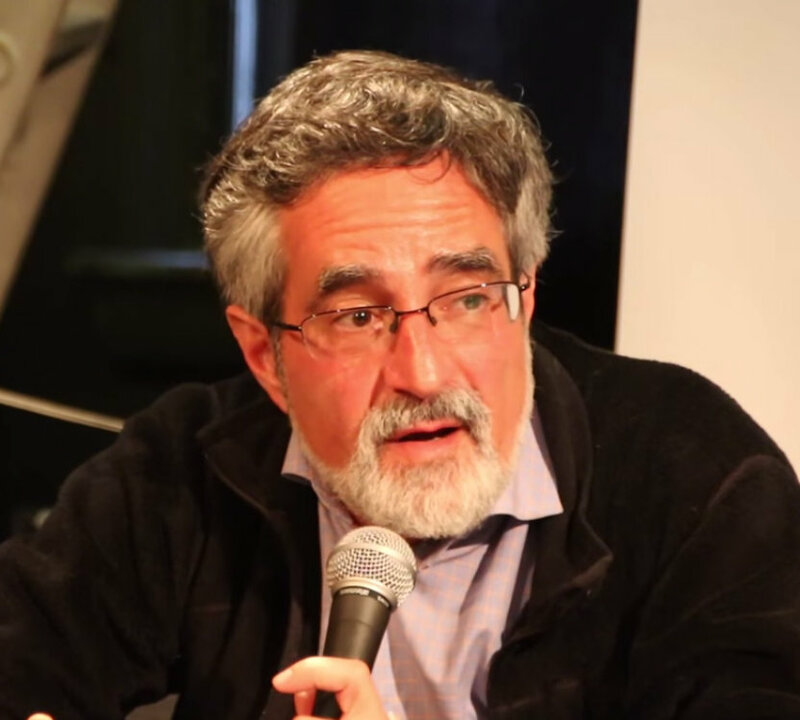 Peskin defended his record on improving bicycling, walking, and transit as a former supervisor, and said his position on the Polk bike lanes has not changed recently. When Christensen was appointed by Mayor Ed Lee to the office in January, “The plan was in jeopardy,” she wrote. Peskin served two terms as D3 supervisor from 2000 to 2008, and acted as board president from 2004 to 2008. In 2011, he was nominated for appointment as interim mayor by the Board of Supervisors when Gavin Newsom vacated the office. The board instead appointed Lee as mayor, who was then elected to remain in office. Lee faces re-election in November along with the D3 candidates. Mayor Lee and former D3 Supervisor David Chiu haven’t called for a more ambitious Polk plan, which starts construction next year. Lee’s optometrist fought the Polk bike lanes, and the SFMTA removed them from the office’s block shortly before the plan was approved. During his tenure, Peskin said he’d tried to “de-politicize” such SFMTA decisions on street changes with 2007’s Proposition A, which he authored to remove the Board of Supervisors from SFMTA decision-making. The proposition was passed by voters, but “the SFMTA has not used it with all of the powers that have been bestowed upon it,” he told Streetsblog. Prop A, it’s worth noting, also thwarted a proposition pushed by Gap billionaire Don Fisher to promote more parking garages downtown. Prop A also gave more parking meter revenue to Muni, though it was siphoned to other agencies at the behest of former Mayor Newsom, Peskin says. 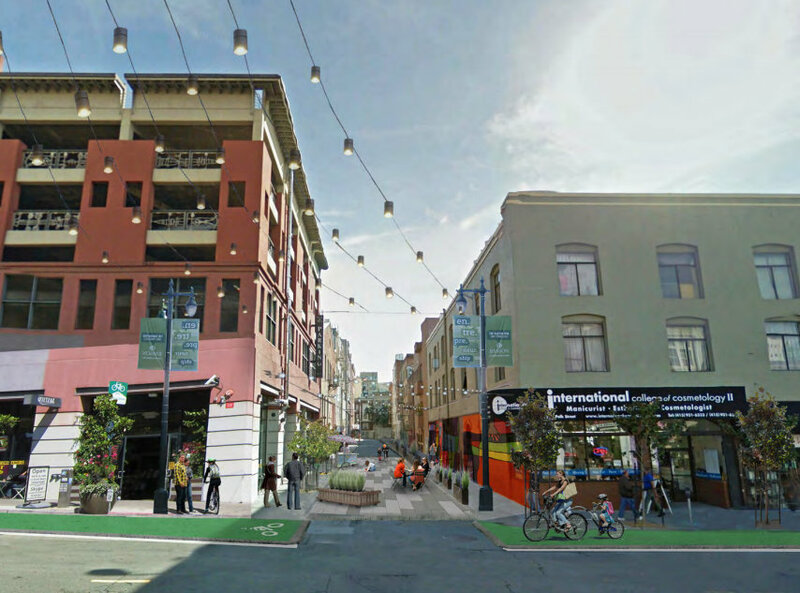 Peskin touted his record on livable streets, which includes his support for Fisherman’s Wharf’s people-friendly redesign of a block of Jefferson Street that removed all car parking. He also sponsored downtown parking reforms authored by Livable City, which removed minimum parking requirements and limited curb cuts for driveways. Peskin, who is married to a land use attorney, is known for his knowledge of the environmental review process and for making liberal use of legal actions, especially against building development. In his recent years out of office, he’s campaigned to keep building heights low along the city’s waterfront and helped file lawsuits over the environmental review for the America’s Cup races. In 2013, Peskin filed an ethics complaint against SFMTA Board member Cheryl Brinkman for voting to approve a contract for work on the Central Subway, for which he dropped his support in 2011. Peskin had remained quiet on the Polk bike lanes prior to the SFBC questionnaire. He told Streetsblog he’d simply stayed out of the fray because he wasn’t holding office, and didn’t launch his campaign until March. Sources close to the situation on Polk said Peskin was consulted by MPNA’s Dawn Trennert, who gave $100 to Peskin’s campaign, according to Ethics Commission records. Kowalski and Trennert have not returned emails and phone calls requesting comment on Peskin’s consultation and support for expanding bike lanes. The SF Bicycle Coalition is expected to announce its candidate endorsements soon. Its member poll taken last week, distributed along with the candidate questionnaire responses, will weigh heavily. SFBC Communications Director Chris Cassidy said the organization is “excited to have Aaron Peskin’s support for continuous, protected bike lanes and pedestrian safety improvements” on Polk. One important thing we’ve learned in working with communities for safer streets is that our democracy works best when everyone’s fully educated about their rights, and encouraged to engage in the manner they see fit. This is how we achieve life-saving improvements. This guy is going wherever the money blows. Think he consulted them “on their rights and options” for free? Give me a break. This is lip service to the nth degree — the only reason he would support transportation, bicycling, or pedestrian improvements is if there was something in it for him. Sources close to the situation on Polk said Peskin was consulted by MPNA’s Dawn Trennert, who gave $100 to Peskin’s campaign, according to Ethics Commission records. Wow. Sometimes finding out who supports a candidate is all you need to know. He’s a drunk bully. From when he was the board president, Chronicle 2008: President of S.F. supes accused of harassing calls, threats. Disqualification right there. This guy is running campaign fundraisers for Peskin and Peskin has no clue about this? Peskin is a liar, or a fool. Either way, let him stay in his gadfly role. SFBC will endorse this guy no matter what the votes are. And of course the SFBC board will not disclose the membership votes. Deep? Deep? Calling Deep? What say you Deep? …and he doesn’t ever read his local papers, The Marina Times for one, which just favorably interviewed him http://www.marinatimes.com/2015/08/meet-your-candidates-for-district-3-supervisor/ and in which Kowalski has extensively quoted. His war chest has a lot more than multiple $100 contributions. Who’s donating? Kowalski tried to have me voted out of a public meeting if I didn’t reveal the merchants who requested that I attend because they couldn’t. I didn’t leave and later in that meeting, his cohort told me to “Shut the F__k up!” when I pointed out facts that were too inconvenient to hear. Kowalski has been bull-headed, two-faced, aggressive and abusive but has never flip-flopped re. Polk St. What he has flipped regularly is his lid. Great deep background, Aaron. Of course, just consulting wouldn’t be so bad but it was not a simple lawyer/client consultation. I’ve written the folks I know at SFBC and asked them to either endorse Julie Christensen as a result of this double-dealing, or at least issue no endorsement. It would be great if everyone on this forum would do the same. That’s ugly. But not surprising, unfortunately. Sorry you had to put up with that. Why is this guy even hanging around? This is just like having Clinton and Bush running for President. We already suffered through Peskin. Give one of the other quarter-million eligible San Franciscans a shot at ruining the city for a change. He isn’t even a lawyer! Yes, the Ed Lee and Ron “lifelong Republican” Conway puppet: Julie Christensen is the #1 choice of developers, real estate agents and tech CEOs so yeah thats the way to go! Where online can we find out? I think we will end up with no endorsement. Do you know that for a fact or are you just regurgitating what you read on 48hills? I’d be very interested in an incident you witnessed directly or some form of citation apart from the public facts that Lee appointed Christensen and that Conway gave her campaign several hundred dollars that proves either of those assertions. By the way, we’re talking about transportation and designing livable cities here, if you didn’t get the gist of the post. The rest of that stuff belongs on SFGate. Ron “lifelong Republican” Conway has created a PAC he and his buddies can shovel unlimited cash into to support the right wing leaning candidate in this race – that’s what Republicans do – he just dumped $27,500 to pay for polling for Ms. Christensen. As for this post its about a current candidate running for a seat on the BofS – it’s an inherently political article. Its timing and content is a swipe at Peskin. Fair enough, but one must look at the Republican backed opposition to get a full picture. Peskin was duplicitous in his answers to the SFBC, double-dealing behind their backs. That’s the subject at hand, not your fevered imagination around Julie Christensen somehow being “right wing leading” which is one of the most incomprehensible statements ever, given her record of support for transportation and livable cities issues. She’s a more moderate Democrat than Peskin, that’s true, but even FDR seems moderate by comparison. I wrote Noah and told him what I think. The sad truth is that of course he knew and he went to the Save Polk Street crowd anyway. I really don’t think that anyone can trust Peskin. Big donors’ requests carry more weight than others’ especially now. This just went online: map light.org. Haven’t had a chance to look at it. To me it seems pretty hypocritical for this guy to say one thing about supporting PROTECTED bike lanes while also giving legal advice and assistance to a group that wants to kill those very same bike lanes on Polk St. Seems pretty ridiculous.